Black and yellow bands on this wasp warn birds and other predators to stand down. One of the hallmark events of late summer and early autumn is the blooming of goldenrod. Spectacular arrays of brilliant yellow flowers attract throngs of insects intent on collecting and consuming the nutritious pollen found in hundreds of small flowers on each plant. Goldenrod gets a bad rap each fall as people with allergies complain about its pollen. The truth is that the pollen of goldenrod is quite large, rather sticky, and adapted for transport from plant to plant by the activities of insects rather than wind. The most likely way for someone to get a dose of goldenrod pollen would be to stick their nose into the small flowers like a bee. Don’t do that! The real culprits for many of the seasonal allergies at this time of year are the ragweeds with their airborne pollen. Larvae of the locust borer are known as round headed borers. They make galleries beneath bark that can kill branches and sometimes entire trees. Last year we met a bevy of bugs on goldenrod (The Goldenrod Gang), but this year is especially good for viewing one more member of the gang, the locust borer, Megacyllene robiniae. The adult stage of the locust borer is a spectacular insect called a longhorned beetle, so named for the very long antennae adorning its head. The yellow lines found on its back are a beautiful match to the brilliant yellow of the goldenrod blossom. On sunny days goldenrods are abuzz with many kinds of stinging insects such as paper wasps, bumble bees, digger wasps, and potter wasps. The yellow and black pattern on the back of the locust borer is a fine match to the pattern of some of these stinging insects. Birds that might like to eat a tasty beetle probably think twice when they see a yellow and black insect that might deliver a memorable sting. This is one way the locust borer likely gains protection from its enemies. 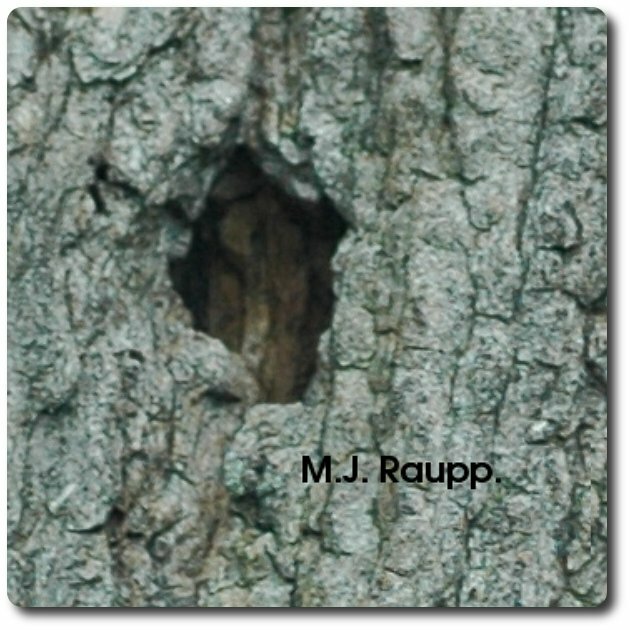 Adult beetles exit the tree through holes in the bark cut by larvae. After dining on goldenrod pollen and finding a mate, the female locust borer flies to the trunk of a black locust tree and lays eggs in crevices or wounds on the bark. 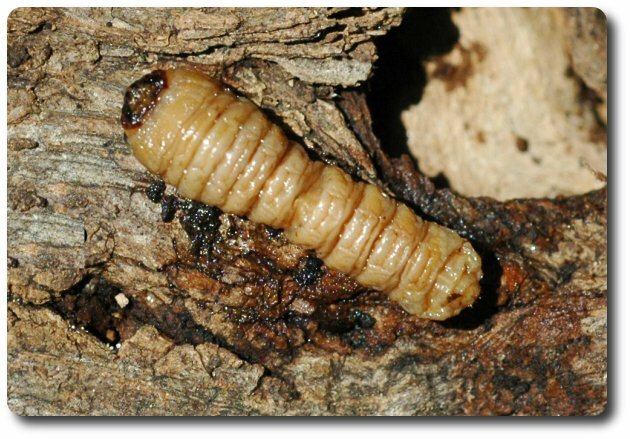 These eggs hatch into larvae called locust borers that tunnel beneath the bark destroying vascular and structural tissues. In this way they harm black locusts much like the emerald ash borer, and the banded ash clearwing borer we met last month, damage or kill ash trees. If trees are small or the borers numerous, branches or entire locust trees may be killed when attacked by the locust borer. However, it is not unusual to see a veteran black locust with numerous locust borer wounds surviving nicely along hedgerows, lanes, and trails throughout the eastern forest. Now until the first hard frost is an excellent time to spend a few moments in the goldenrod patch to gain a glimpse of these magnificent creatures. 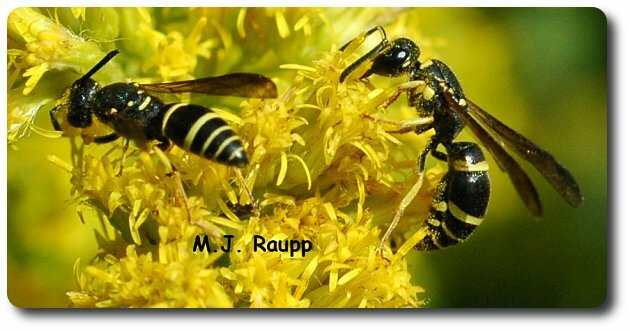 For more information on the locust borer and goldenrods, please visit the following web sites.